After months of chipping away at it, I've completed Final Fantasy I. It had it's ups and downs but I must say it has provided me with hours of entertainment. You have to admit, months of entertainment for $9 is a steal. My completion time was right around 18 hours, but it was broken up into chunks of 5-10 minutes which is why it lasted so long. I think the longest play session I did was around 30 minutes and that only happened once. As always, my initial impressions still stand but I had a few other thoughts along the way too. The main thing I liked about this game was the chance to look back at the foundation of modern RPGs. 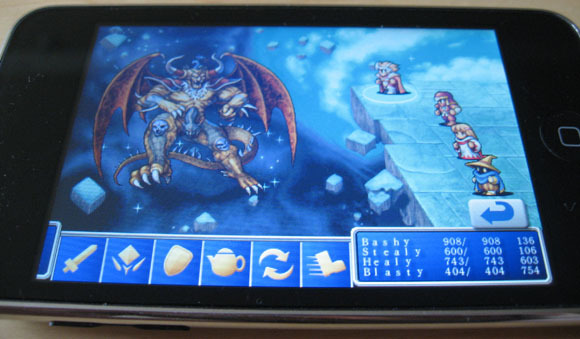 Final Fantasy basically defined the shape of the JRPG genre and many of the conventions set forth in this game can still be seen in RPGs today. The whole game was fun back-to-back dungeon romps. If you're in the mood for that type of gameplay then Final Fantasy I still measures up. Where it doesn't measure up is the story. Almost all relevant information about the story is revealed in the first half hour and the closing epilogue, the 17.5 hours in between are pretty bare. The four Heroes of Light have to defeat the four Fiends to restore the crystals' power and defeat the evil Garland. That sentence was the entire story for 18 hours. There are side quests and obstacles that need to be overcome, but none of them advance the characters or change the shape of the story. And that's the thing I missed the most, a driving storyline. My favorite Final Fantasys, VII through X, all have a driving storyline with character advancement and plot twists along the way. Watching Cloud come into his own against Sephiroth and holding my breath to see if Zidane and Garnet would be reunited are moments captured in my mind forever. While I still knew why I was adventuring in FFI I, didn't really care about the reason. I'm interested to see how story becomes more important throughout the progression of the series. I've always wanted to go back and play through the first game in this series that I love. I'm proud of myself for actually doing it! I think it's amazing to look how far we've come in such a short amount of time. 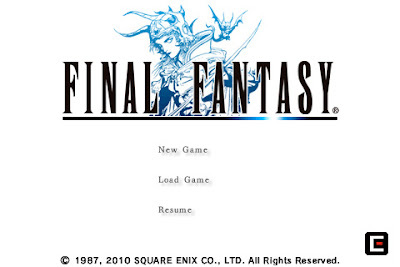 Now I need to determine the next Final Fantasy that I'm going to play through. It's probably either going to be FFII or FFVI since I have them both already. The question is, do I want to keep going chronologically or do I want to take a break from the super old school and play something closer to modern? I don't know. I'm going to take some time to think about it before I decide. The stories get stronger as the series progresses. As far as non-Japanese are concerned, only FF1 has a weak plot. FFIV (FF2 US) and FFVI (FF3 US) are both wonderful stories. That's good to hear. I know the stories are better from FFVII and above, just because I've played them. It's nice to know that FFII has a decent story too. Since that's the case I'll probably play that one next. Thanks for the heads up!